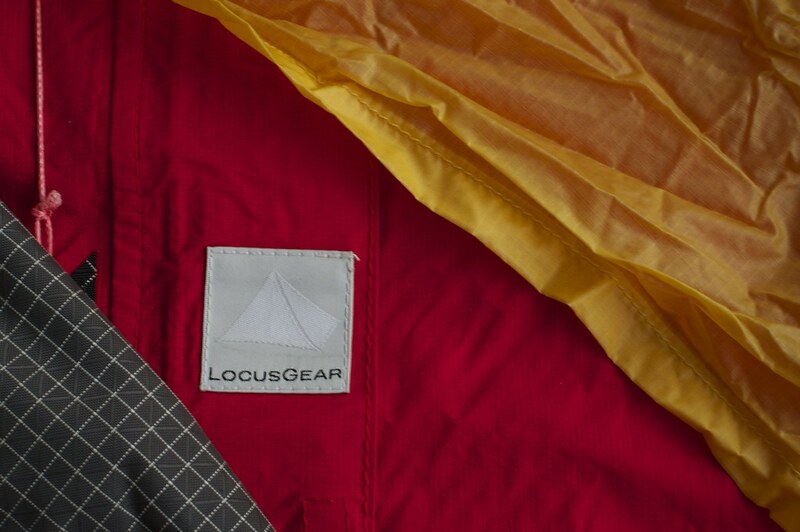 Cottage manufacturers make the Lightweight & Ultralight gear we use and love. And while OR in the USA, and ISPO in Munich right now give us an overload of shiny, new and often not that lightweight gear, Benjamin and me decided to get together and present you the latest and greatest New Gear from the Cottages for 2013! Matthew from Elemental Horizons launched the Aduro SL Pack at the start of the year. 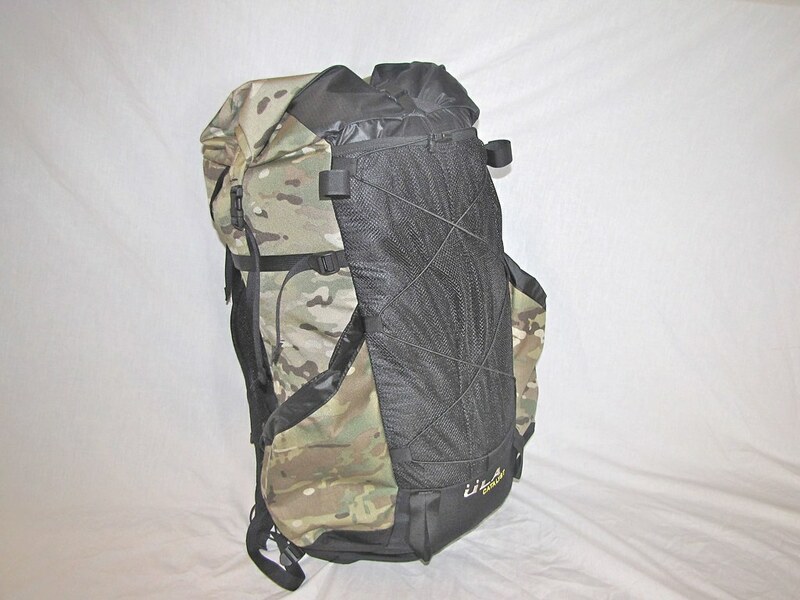 A unique clam shell panel load design makes packing your pack & organizing gear easy, and the Klymit Air Beam frame sheet helps to provide excellent support and comfort. This 42 l backpack - roomy enough to hold a weekend bear canister inside - comes in two torso lengths and weighs 663 g with a Frame Sheet, or 570 g without, and is made in the USA. YAMA Mountain Gear will soon release a single wall version of the Cuben Cirriform Tarp and expand their DIY line to include a Cirriform Kit - great news for Cuben Lovers & MYOGers alike. The Cuben Cirriform in the minimal configuration will weigh a scant 213 g; and the craftsmanship going into this shelter is going to make is (water-) bomb proof. YAMA is also giving back to the community with their mYAMAdventure program. It will assist hikers with their first ‘big adventure’ while giving back to those maintaining and protecting the trail systems, and is a unique case of a cottage giving back to the community - Respect! Mountain Laurel Designs has a lot of new gear coming this year, and does that while staying 100% in-house, craftsman-driven, and made in the USA! Those who order from MLD will also like to hear that the company expanded their production to allow for shorter wait times. Ron has sourced a 10d 3XDWR fabric and ClimaShield Apex insulation which means there are going to be some new quilts coming this year. Their current quilt is well-liked, and this is surely going to be a hit with the synthetic quilt crowd. SUL Fans are surely going to like the 99 g Cuben pack MLD is going to release this year. Design-wise it will be like the Newt with one rear pocket; so really something for SUL/ XUL backpackers who pack a minimal kit, or those who look for a very light daypack/ summit pack. The Burn and Prophet packs will get an inflatable frame option plus load lifters, which means they get an internal frame pad sleeve that fits the current Klymit backpack frames, like the current Exodus FS minus the CF rod rigid frame. Made for those who need a bit more support and don’t like using the traditional virtual frame (Burrito-Style sleep pad inside the pack), this gives you more vertical support. Oh, and women’s versions of all packs are due as well. That’s great news! The prototype TrailStar Compact (a better name is sought) is in the works, and should fit smaller people better. It’s lighter, too - about 71 grams. It will be about 15% smaller with a 6’ baseline at the edge vs the 7’ of the regular one. A date when it will be available has yet to appear. 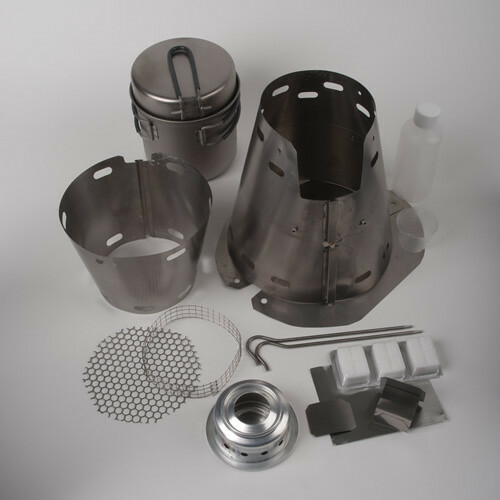 The guys at Trail Designs just released the Fissure & Fusion split cone systems, which means there’s more protection for your stove and pot while still allowing you to pack the cone inside your pot. They’re also working on a little add-on which will come later this year, and should make cooking on your Trail Designs stoves a lot easier! Lite Trail not only sells a wide variety of very useful UL accessories, they also have some very exciting new gear coming for us UL backpackers! The LiteTrail H-Line Hang and Haul Dyneema Cordage is already available, which is a 2.5 mm diameter high quality Dyneema cordage. A slick nano coating and 580 kg breaking strength means you also can haul not so UL loads with it! 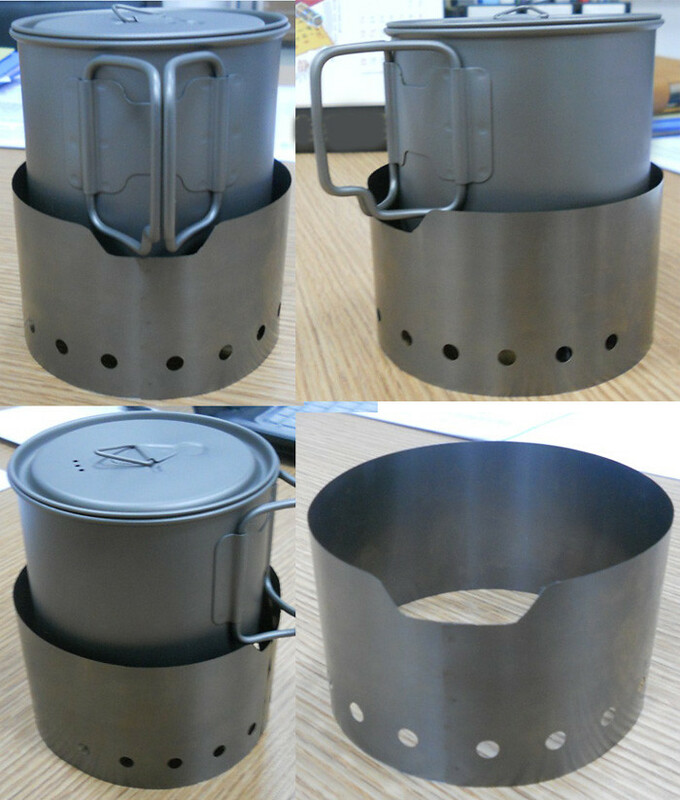 The lightest Solid Fuel Cook System on the market just got better! The pot gets handles with heat resistant rubberized covers (the photo shows an early prototype), and the windscreen is redesigned with spot welding so paper clips are no longer required (they’re easy to lose if you’re not careful). A narrower spaced hole pattern that goes 50% around the circumference and a nice contoured cutout for those new handles was also added. A 900 ml pot is also coming some time this year and all pots should be lighter than what’s currently available, so good reason to be excited! Winter backpackers who need to melt snow will like the 1600 ml Titanium pot that LiteTrail is hoping to bring out soon, which would also make a great group pot for summer trips. A flat top lid, possibly a bail wire handle for hanging from a tripod over a wood fire (yay!) and again lighter than any other 1600 ml titanium pot on the market. ZPacks’ owners Joe and Sheryl Valesko are thru-hiking the Te Araroa Trail in New Zealand at the moment, and while Joe gets a lot of ideas while on the trail these will need to wait until April to be constructed! At ZPacks Matt Favero is managing the store and it is open, and all the gear is available as usual. ULA Equipment has been going from strength to strength in 2012, and have made a lot of people very happy by releasing their backpacks in camo and purple besides the standard green. For 2013 ULA will offer any of their packs also in Cuben, which is very exciting for those who want to save even more weight! The ULA packs are now made from the new ULA 210 Robic fabric, which is three times as hard to puncture than Dyneema. However, the packs remain the same weight, which means you are getting a lot more durability now. I also asked Chris about how he feels that Brian Frankle (who is the Founder of ULA until he sold the company) joined Six Moon Designs. Chris was very positive about it and thinks that Brian will help SMD to improve on their current pack line, and he wishes them all the best with their cooperation. Warbonnet Outdoors is coming out with a new version of their popular Blackbird hammock, the Blackbird XLC. It is longer, and has a convertible top. Here is a video where Brandon shows it off. Jacks ‘R’ Better has a new website! But that’s not all that got re-designed: JRB top quilts now come with 14 baffle sections versus the older 10 baffle sections for better down stability. You’ll also like the price reductions across the board for quilts and hammocks - JRB quilts are now even better & more affordable! The Jacks will also have a limited quantity run of a digital camo down quilt. If that’s something for you, subscribe to their Newsletter as these are bound to sell out quickly! Judy from LightHeart Gear has a couple of great ideas, which she is Alpha testing on the trail at the moment and hence can’t tell us more. There’s also going to be a camouflage silnylon version of the great Solo Tent, and in case you didn’t know yet, yes, you can get a Solo now in Cuben! LAUFBURSCHE is coming out with an UL shoulder bag for those who want to carry a minimalistic bag when they head to a meeting or to the office. Impeccably made German quality, this is going to be the next ‘in’ item in the UL community, I reckon. Nothing new here besides the cottage itself! Gardner Outdoor Lightweight Designs offers Polycryo tarps, trekking poles and a variety of stoves. Prices are reasonable, so give them a look. Mountainfitter, also known as Lawson Equipment, sells a variety of UL accessories that you might need but are hard to find. 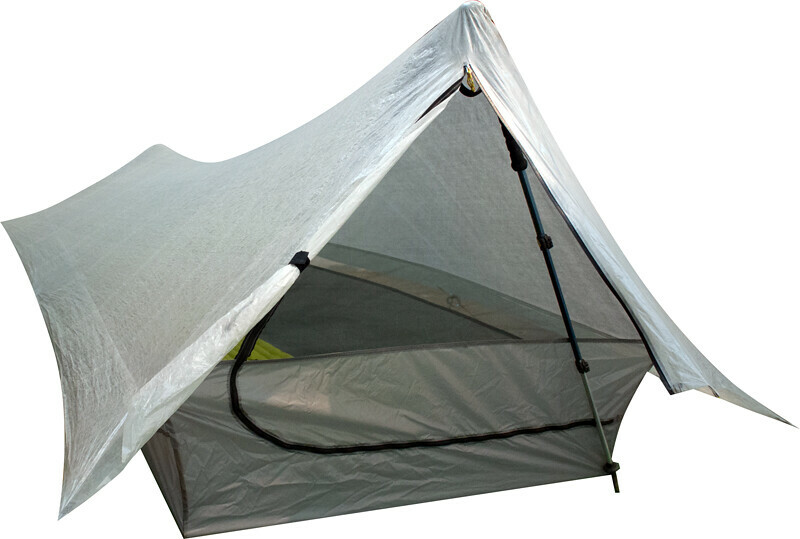 While in the past they have offered Cuben shelters, these are at the moment not available. While Klymit is not really a cottage I’d say, those who like amphibian travel options (aka packrafting) will be delighted to hear that the company is planning to bring out a small packraft. 907 grams light and it packs as small as a book. It looks like another company realizes that packrafting is a growing segment for outdoors people, and at $225 it is even cheaper than the FlytePacker! Speaking of FlyWeight Designs, besides the new website (well, it went life last year in spring =) there’s not much information coming from the company. They were working on a inflatable seat last year, as well as on a new sub-2 kg packraft, but otherwise there hasn’t been much news from them. I heard back from Marc and they’re indeed still working on some prototypes, so keep you eyes on their site for news. Hyperlite Mountain Gear is set to enter the Pyramid Shelter segment this year, with one-person, two-person and four-person sizes. Yes, that’s right - and that’s all I’m able to tell you at the moment. Sorry! Keep your eyes on their website & social media channels to get a glimpse of these shelters at some point! 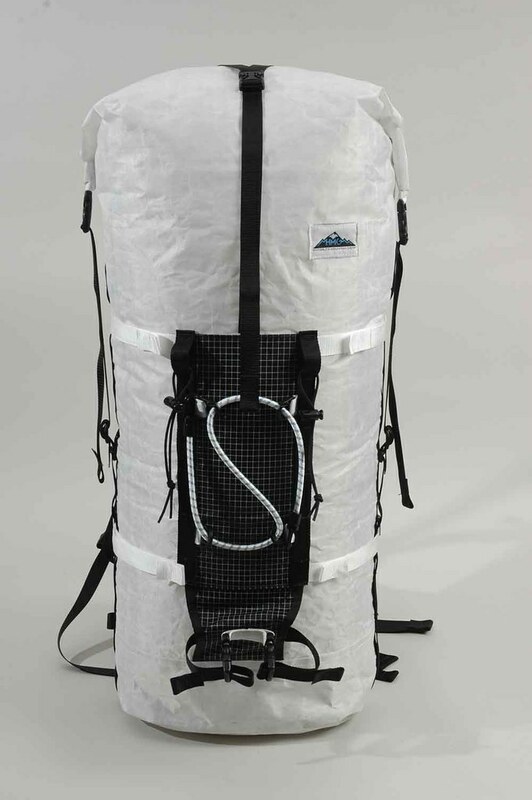 In 2012 HMG released a couple of note-worthy UL items, like a 3400 cu in version of their ice climbing and winter mountaineering pack, the Ice Pack. I have the 2400 version and love it, so the extra space in this pack means you can go for a weekender to the mountains and carry it all in your pack. A removable, padded hip belt adds a bit more comfort and support, and the exterior patch for crampon and ice axe attachment makes sure nothing spiky can destroy your pack. Oh, and a 4400 cu in version of this pack, as well as the Windrider, are in the works, too. 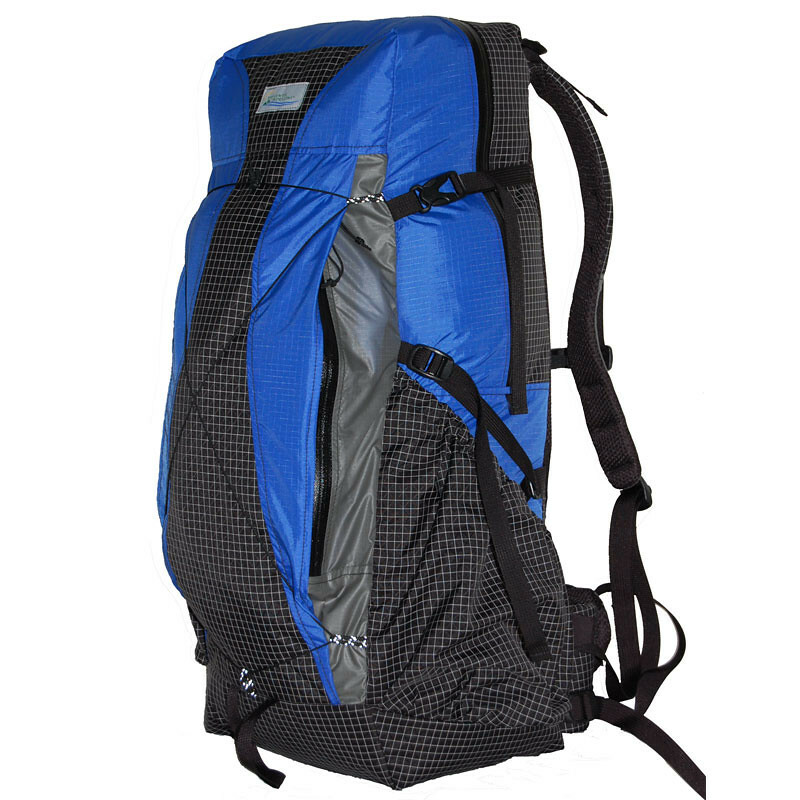 Another pack I’ve been using for a long time now got a 2400 cu in version: The Porter Pack. This smaller brother comes without a frame and weighs 737 gram, and now comes with the option to add two Spectra Hardline, zippered hip belt pockets, and of course has the simplicity of its big brothers. 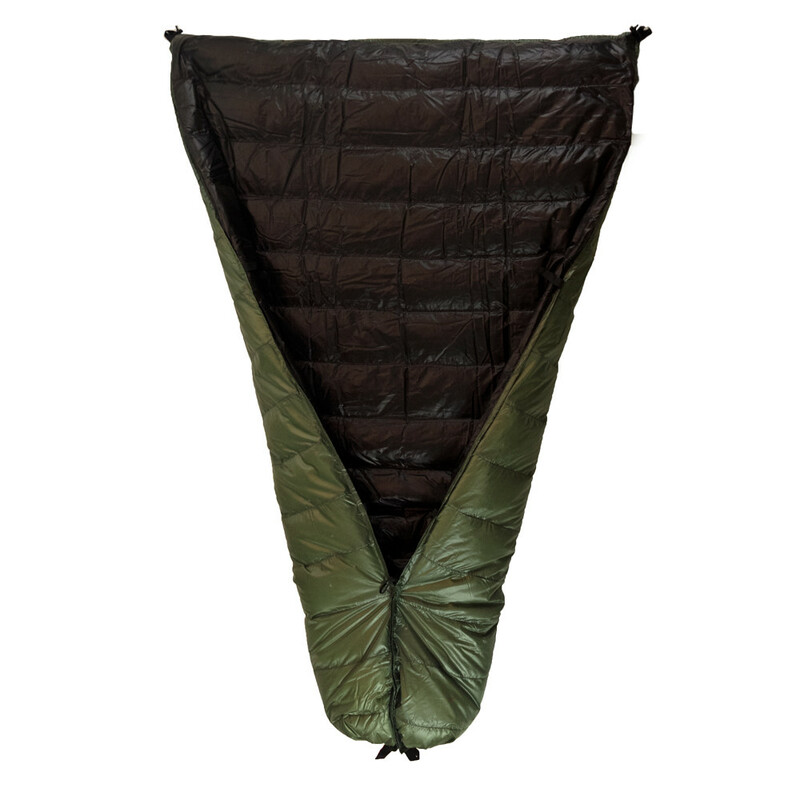 Cuben fiber flat tarps in three sizes came out in 2012 as well. A flat tarp is a great, versatile shelter and it’s good to see these kind of shelters being offered. That ain’t all! Today (Wednesday) you should head over to Benjamin from hrXXLight to see what’s new from LOCUS GEAR, enLIGHTened equipment, Aarn Designs and others! Itching to buy some of this new gear? Once it becomes available you should surf to Trekking-Lite-Store.com your European source for many of these brands, and save yourself the hassle on shipping & expensive customs charges. They will carry much of the new gear, I was told! Did you know that I am trying to make Hiking in Finland my main job? If you liked this article, buy me a cup of coffee to support me! Are you a cottage manufacturer or know of one and should be included in this & future articles? Email me!